Hubble's scientific instruments work either together or individually to bring us stunning images from the farthest reaches of space. Presently, Hubble can accommodate five scientific instruments and three fine guidance sensors. The instruments are housed in the bottom third, or aft section, of the telescope. Science instruments for Hubble are classified according to where they are mounted in the telescope. Axial instruments are about the size and shape of a telephone booth. 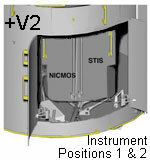 Axial instruments are mounted in the rear of the telescope along the optical axis. Light from the telescope's mirrors enters these instruments directly. Radial instruments are mounted above the axial instruments and to the side. 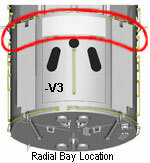 Radial instruments receive light by use of "pickoff mirrors" which redirect the light path into the instrument through apertures. ACS (Advanced Camera for Surveys): the newest camera (2002) with a wider field of view, and better light sensitivity than WFPC2. It effectively increases Hubble's discovery power by 10x. COSTAR (Corrective Optics Space Telescope Axial Replacement): contains corrective optics for spherical aberration in the primary mirror (technically, not an instrument). COSTAR is to be replaced by the Cosmic Origins Spectrograph (COS) instrument in Servicing Mission 4. COS (Cosmic Origins Spectrograph) (Post SM4) is an ultraviolet spectrograph optimized for observing faint point sources with moderate spectral resolution. NICMOS (Near Infrared Camera and Multi-Object Spectrometer): Infrared instrument that is able to see through interstellar gas and dust. STIS (Space Telescope Imaging Spectrograph): separates light into component wavelengths, much like a prism. The radial bay is a donut-shaped reservour sitting above the axial bay and houses the remaining scientific instruments. 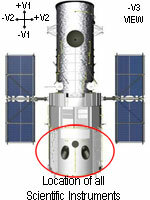 Presently, Wide Field Planetary Camera 2 (WFPC2) occupies one of the four radial bays available on Hubble. WFPC2 is responsible for taking many of Hubble's famous pictures. 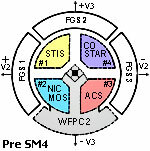 WFPC2 is to be replaced by the next generation of camera, Wide Field Camera 3 (WFC3), in Servicing Mission 4. 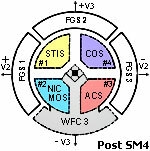 The remaining three radial bays house the Fine Guidance Sensors (FGS), used primarily to control pointing of the Telescope. The sensors are in the focal plane structure, at right angles to the optical path of the Telescope and 90 degrees apart and have pick-off mirrors to deflect incoming light into their apertures. The sensors lock onto guide stars and measure relative positions, providing data to the spacecraft's targeting system and gathering knowledge on the distance and motions of stars. 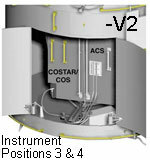 When two FGSs lock on guide stars to provide pointing information for the Telescope, the third FGS serves as a science instrument to measure the position of stars in relation to other stars.